Could This Bold New Technique Boost Gravitational-Wave Detection? 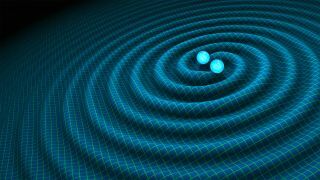 An artist's illustration of two black holes spiraling together, creating gravitational waves in the process. Gravitational waves that we can detect here on Earth are generated by the most energetic events in the cosmos, from colliding black holes to merging neutron stars. To spot these space-time ripples, which have traveled billions of light-years in some cases, scientists must build some of the most sensitive equipment the world has ever seen. But the very sensitivity of this gear means that vibrations, turbulence and even gas molecules in our atmosphere can drown out even the most powerful gravitational-wave signals in a crescendo of background noise. In September 2015, the historic first gravitational-wave signal, caused by two colliding black holes, was spotted by the Laser Interferometer Gravitational-wave Observatory (LIGO), a project that operates two detectors — one in Washington, and the other in Louisiana. This detection was achieved by using powerful "interferometers" that can detect minuscule warps in space-time. The twin L-shaped LIGO buildings measure 2.5 miles (4 kilometers) along each arm and consist of highly efficient vacuum chambers through which the lasers and all optics are directed. Based on the principle of Michelson interferometers, from the famous Michelson-Morley experiment in 1887, laser light is directed from one end of the L to a beam splitter at the intersection. The split laser light is then reflected back and forth along the tunnels and then allowed to converge once again at the intersection, after the photons have traveled 700 miles (1,120 km). When the two laser beams are recombined, they cancel each other out, as both have traveled the exact same distance along their respective tunnels; the waves of laser light are finely tuned to be out of phase and will therefore destructively interfere with one another. However, should a gravitational wave travel through our planet, one of the detector's arms will distort slightly, causing one of the beams to travel a slightly longer or shorter distance, creating a tiny mismatch in phase. The fine-tuning is knocked out of balance, the waves constructively interfere and a signal is recorded. It's like a high-tech trip wire for gravitational waves. And the ripples cause a minuscule fluctuation in distance; LIGO can detect a change in arm length thousands of times smaller than the width of a proton. Because this signal is so slight, physicists must ensure that sources of noise are kept to a minimum. So the entire system is encased inside a vacuum chamber (to remove sources of noise, such as air turbulence, sound waves and gas molecules), and the mirrors and other optics are shielded from other sources of vibrations, such as seismic waves and even nearby traffic. "The main challenge in the LIGO vacuum tubes is to keep the pressure low; we need it to be around a trillion times less than atmospheric pressure," said LIGO team member Rana Adhikari, a professor of physics at the California Institute of Technology in Pasadena, who wasn’t involved in the new study. "This is relatively easy in a small, high-quality, laboratory setup but extremely challenging for a 4-kilometer-long tube." The Laser Interferometer Gravitational-wave Observatory (LIGO) facility in Louisiana. Another LIGO detector operates in Washington state. One of the biggest components of current gravitational-wave detectors is the vacuum chamber where all the interferometer optics are housed — a component that, according to the new study, could be removed from future gravitational-wave interferometers. "What we demonstrate in our paper was a turbulence-free double-slit interferometer, which isn't exactly ideal for gravitational-wave detection, but the mechanism that produces the turbulence-free interference can theoretically be applied to any interferometer," said lead author Thomas Smith, a postgraduate from the University of Maryland, Baltimore County (UMBC). "Our future steps are to look at those interferometers that are ideal for gravitational-wave detection by their layout and see if we can apply this mechanism to those," Smith added. "We could, theoretically, have a gravitational-wave detector out in the open air." In the study, Smith and Yanhua Shih, a physics professor also at UMBC, argue that the quantum properties of light could be used as a powerful and, potentially, revolutionary new tool for dealing with interferometer noise and detecting even the weakest gravitational-wave signals. The experimental setup proposed by Smith and Shih is based on an 1801 double-slit experiment devised by English physicist Thomas Young to demonstrate the wave theory of light. It was later used to demonstrate the wave-particle duality concept in quantum mechanics in the early 20th century. In its most basic form, the experiment consists of a light source that illuminates a plate, which has two slits for light to pass through. Behind the plate is a screen. As the light passes through the slits, the waves constructively and destructively interfere, creating a classic pattern of light and dark bands on the screen. But what if you were to fire just one photon at the slits? Well, through the weirdness of quantum physics, that photon is just as probable to travel through slit A as it is slit B and can therefore interfere with itself to create an interference pattern on the screen. (For an in-depth explanation, read this classic Space.com piece.) This is a useful demonstration of quantum physics, but it would be useless in a gravitational-wave detector; single photons will be affected by air turbulence, so the paths to slit A and slit B will vary, jumbling the photons' phase and blurring out any interference pattern. So, Smith and Shih suggested that, instead of the one-photon interference, two-photon interference patterns can be measured, and the noise that muddles the one-photon interference pattern will simply disappear from the equation. Much of the detail behind this method is buried in complex math, but it could provide a surprisingly elegant solution for laser interferometers, the researchers said. Two-photon interference "is kind of a new concept in physics in the past few decades, and it seems to be catching hold," Smith told Space.com. "You can have two potential paths for the two photons to travel. And when you scan your two detectors in approximately the same location, these two potential paths for the two photons overlap. And, because of that overlap, both potential paths experience the same turbulence, the same phase shifts. And, because they're experiencing the same phase shifts, the interference pattern is unaffected … Within the math, the turbulence cancels." The researchers even demonstrated this method with a tabletop experiment incorporating a laser light source, double slits and a toaster oven in between to create air turbulence. When the oven is turned on, the classic interference pattern abruptly disappears; the air turbulence disrupts the photons, preventing interference from occurring. But if you carefully position two detectors to precisely measure the two-photon interference pattern and then turn the oven on, the interference pattern persists as if there were no turbulence at all. "The classic interference pattern disappeared [when the oven was switched on], but the interference pattern we measured from the intensity fluctuation correlation in this turbulence-free interferometer remained at nearly 100 percent — still very clear," Shih said. In this situation, the researchers can measure the pattern generated when pairs of photons interfere with themselves after traveling the same path from the coherent light source to the slits. In effect, these pairs of photons experience the exact same turbulence during their journey, like two passengers sitting next to each other on a roller-coaster ride. Sure, the two passengers will experience a lot of ups, downs, loops and wobbles, but they will arrive at the end of the ride having traveled along the exact same path. Like the roller-coaster passengers, to the pairs of photons (and the interference pattern they create), it's as if the air turbulence weren't even there. By the researchers' logic, if this system could be scaled up and somehow incorporated into the optical system of gravitational-wave interferometers, these detectors could function in the open air, and highly efficient vacuum systems would no longer be required. And once this complex system was removed, the possibilities would become very exciting. A simplified layout of the Advanced LIGO detector. The researchers emphasized that turbulence-free interferometry has a long way to go before it can be used for gravitational-wave detectors. But gravitational-wave scientists are skeptical that highly efficient vacuum tubes will ever be removed from ground-based detectors. "Our detectors could not work in 'open air,'" Nicolas Arnaud, a physicist with the Virgo experiment, told Space.com via email. "The mirrors (key interferometer components) would lose their unique properties, as their surface would be contaminated by dust; and dust particles would actually be burnt due to the high laser power incident on the mirrors, damaging their surface more. In addition, the laser beams traveling along the kilometers-long detector arms would undergo scattering due to air, which would impact the detector sensitivity." Although he agrees that the theory behind two-photon interference as a method to remove atmospheric turbulence is interesting, Adhikari argues that a far more significant problem is the noise caused by laser light hitting gas molecules in the air. "If we allow the pressure to get 10 times higher than our goal, we run into problems with light scattering from gas molecules," Adhikari told Space.com via email. "Each molecule makes a little twinkle as it passes through the beam, and the stochastic [chaotic] motion of many individual molecules makes a noise in our beam. It's like covering up the 'chirp' made by gravitational waves with a hiss. "While I imagine their setup can be used to reduce the noise due to turbulent air motion, it would have to also reduce the stochastic scintillation (not due to turbulence) by a factor of 1 million to make gravitational-wave detection feasible," Adhikari said. However, in the two-photon setup, only coherent light will create the required interference pattern. As this stochastic interference is, by definition, incoherent, Shih pointed out that this source of noise will also be removed from the results. "These kinds of scintillation, in principle, will not have any contribution to the intensity fluctuation correlation," he said. Although this may work for small interferometers, scaling it up for use in "open-air" gravitational-wave detectors would mean there are many gas molecules being hit by laser light, attenuating the laser energy and making it inefficient at detecting gravitational waves. "What makes the detection of gravitational waves super-challenging is that such signals are extremely weak and can be covered by several 'noises,' which would make them undetectable unless these noises are properly mitigated — or even canceled," Arnaud added. But Smith and Shih are undeterred by these seemingly insurmountable practical challenges. They recognize that any practical application of their two-photon interferometer for gravitational-wave studies is a long way off. "We have to do more research," Shih said. "In principle, it could work, but more work needs to be done." Follow Ian O'Neill @astroengine or at http://www.astroengine.com. Follow us @Spacedotcom, Facebook or Google+. Originally published on Space.com.